아주 중요한 자료가 JAMA에 발표 되었습니다 (Ray JG. JAMA 2016) . 간질환에서 많이 활용되는 검사 중 하나가 Gadolinium-Enhanced MRI입니다. Gadolinium 은 "rare-earth metal"로 지질학자인 Johan Gadolin을 기념하기 위한 Atomic number 64를 가진 물질입니다. Paramagnetic propertie를 가지고 있고, 간질환에서 널리 쓰이는것이 hepatocyte에 uptake가 되어, 정상과 비정상세포를 구분하는데 아주 유용합니다. 보통 20분 hepatobiliary phase image라고 하는데, Gadolinium enhanced MRI에서는 20분 영상에서 정상 간세포는 uptake가 되어 하얗게 보이는데, 비정상 세포들은 uptake되지 않아 검은 defect로 보입니다. 이 특성을 이용하여 매우 민감하게 병변을 확인할 수 있습니다. 메타분석에 따르면 Gadolinium을 사용한 MRI는 다른 검사에 비해 종양을 발견하는 민감도가 74%에서 87%로 유의하게 좋아집니다 (Lee JY. Radiology 2015). 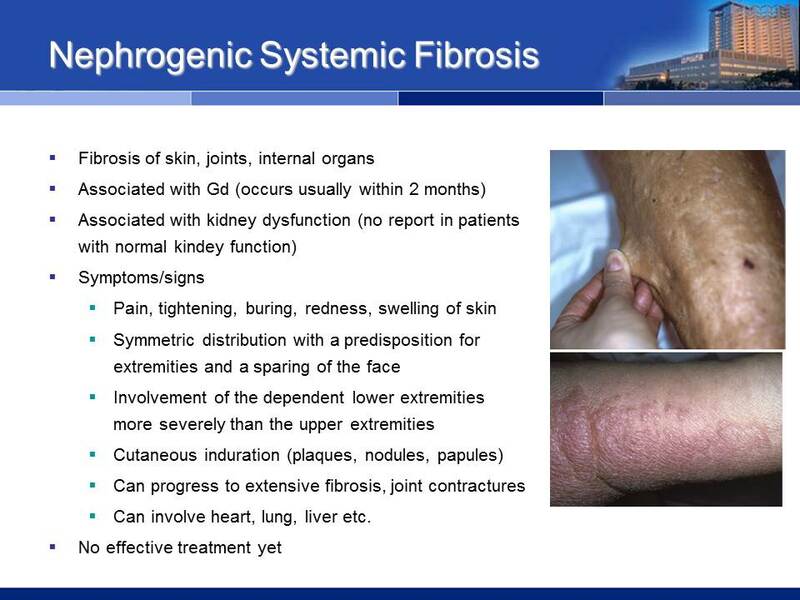 Gadolinium 은 드물지만 매우 유명한 합병증인 nephrogenic systemic fibrosis가 있습니다. 주로 투석환자 등 신부전 환자에게 발생합니다. 이번 JAMA에 Gadolinium MRI가 임산부에게는 위험할 수 있다는 연구결과가 보고되었습니다. "Gadolinium MRI at any time during pregnancy was associated with an increased risk of a broad set of rheumatological, inflammatory, or infiltrative skin conditions and for stillbirth or neonatal death" (Ray JG. JAMA 2016) Gadolinium MRI를 처방할 때 반드시 임신 여부를 확인합시다. 이준행 교수님. 안녕하십니까. 저는 서울아산병원에서 내과 트레이닝 후 군복무 중인 김형돈입니다. 임상에서 한발 떨어져있는 중에 매번 좋은 정보 감사드립니다. 작년에 아산병원에서 해주신 발표 관련 강의도 매우 도움이 되고 있습니다 (EndoTODAY 학회발표 checklist). 오늘 보내주신 gadolinium 관련 내용도 매우 중요한 내용이어서 인상 깊게 보았습니다. 다만 오늘 보내주신 내용 중 약간의 구체화가 필요한 부분이 있을 것 같아 메일을 올립니다. 잘못 되었다는 뜻은 절대 아닙니다. Hepatocyte에 specific하게 uptake되고 20분 hepatobiliary phase를 볼 수 있게 해주는 조영제 중 최근 많이 사용하는 조영제는 gadoxetic acid입니다. 이는 gadolinium-based molecule이긴 하지만 gadolinium 계열의 조영제 중에는 hepatocyte specific property가 없는 molecule도 많기 때문에 구분이 필요하다고 생각합니다. 아래에 제가 1저자로 썼던 논문에 gadoxetic acid와 non-gadoxetic acid를 사용한 MR imaging로 staging했을 때 예후를 본 내용이 있습니다 (Kim DH. Gastroenterology 2015). 참고 부탁드립니다. 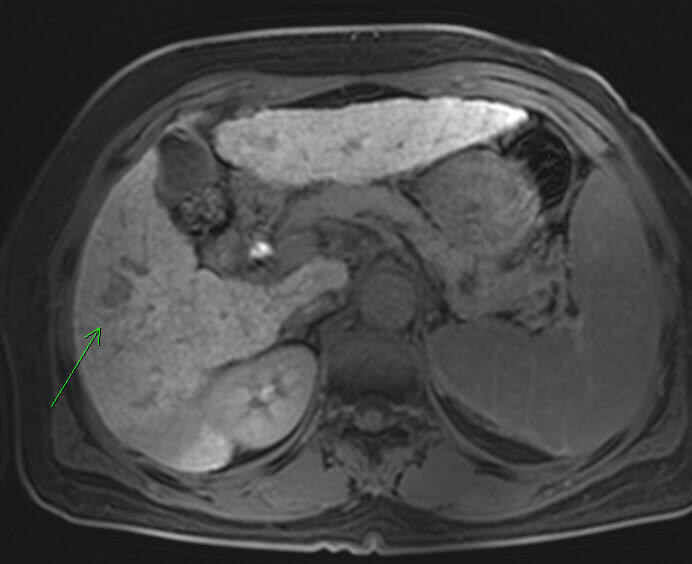 BACKGROUND & AIMS: Hepatocellular carcinoma (HCC) has a high rate of intrahepatic recurrence after curative treatment, possibly because metastases are not always identified before treatment. Magnetic resonance (MR) imaging with a liver-specific contrast agent, gadoxetic acid, can detect small HCCs with high levels of sensitivity. We investigated whether MR imaging with gadoxetic acid increases overall and recurrence-free survival of patients initially assessed by computed tomography (CT). METHODS: We performed a retrospective study of data from 700 patients diagnosed with a single-nodular HCC by dynamic 4-phase CT in Seoul, Korea, from January 2009 through December 2010. Of these patients, 323 underwent additional evaluation with gadoxetic acid-enhanced MR imaging (CT+MR group). The 377 patients who did not undergo MR imaging analysis are referred to as the CT group. RESULTS: The CT and CT+MR groups were comparable in most baseline characteristics (Child-Pugh class A, 93.1% vs 94.7%; and median size of the primary HCCs, 2.8 vs 2.6 cm, respectively). Seventy-four additional HCC nodules were detected in 53 (16.4%) of the patients who underwent MR evaluation after CT (CT+MR group). These detections increased the Barcelona Clinic Liver Cancer stages for 43 patients (13.3%) and modified their treatment plans. On multivariable analyses, the CT+MR group had a significantly lower rate of HCC recurrence (hazard ratio [HR], 0.72; 95% confidence interval [CI], 0.54-0.96) and lower overall mortality (HR, 0.65; 95% CI, 0.44-0.96) than the CT group. In an analysis of 285 pairs of patients matched on the basis of the propensity score, the CT+MR group had significantly lower overall mortality (HR, 0.66; 95% CI, 0.44-0.99). CONCLUSIONS: Among patients who underwent dynamic CT analysis of a single-nodular HCC, additional evaluation by MR imaging with gadoxetic acid led to the detection of additional HCC nodules in 16% of patients, reduced the risk of disease recurrence, and decreased overall mortality. 앞으로도 좋은 내용으로 많은 가르침 부탁드립니다. 항상 감사드립니다. Gadolinium-based 조영제 중 hepatocyte specific property가 있는 조영제는 Gadoxetic acid (Gd-EOB-DTPA) based MRI이기 때문에, 애독자의 comment를 고려하여 해당 부분을 아래와 같이 변경하는 것이 더 좋겠습니다. "Gadolinium based contrast 중 hepatocyte specific property가 있는 Gadoxetic acid (Gd-EOB-DTPA) based MRI서는 20분 영상에서 정상 간세포는 uptake가 되어 하얗게 보이는데, 비정상 세포들은 uptake되지 않아 검은 defect로 보입니다. 이 특성을 이용하여 매우 민감하게 병변을 확인할 수 있습니다. 메타분석에 따르면 Gadoxetic acid (Gd-EOB-DTPA) based MRI를 사용한 MRI는 다른 검사에 비해 종양을 발견하는 민감도가 74%에서 87%로 유의하게 좋아질 뿐 아니라 (Lee JY. Radiology 2015), dynamic CT에서 단일결절로 발견된 환자분들 중 Gadoxetic acid (Gd-EOB-DTPA) based MRI를 추가로 받은 분들은 dynamic CT로 검사한 것에 비해 16%에서 새로운 병변을 더 발견하였고, 질환의 재발률을 줄이고 overall mortality를 감소하였다는 것이 보고된 바 있습니다 (Kim DH. Gastroenterology 2015)"
Gadolinium-based MRI는 세부적인 조영제의 특성에 따라 nephrogenic systemic fibrosis (NSF)의 위험도 차이가 있다고 알려져 있습니다. 좋은 지적을 해주신 김형돈 선생님께 감사드립니다. 좋은 의견을 주신 김형돈 선생님과 LiverTODAY 내용을 보충해주신 신동현 교수님께 감사드립니다. 비록 제가 간질환 전공은 아니지만, 이번 LiverTODAY를 통하여 Gadolinium MRI를 좀 더 이해할 수 있어 즐겁습니다. 우리나라 선생님들이 훌륭한 저널에 발표한 논문들을 통하여 토론할 수 있어서 즐거웠고, 김형돈 선생님 논문(Kim DH. Gastroenterology 2015)의 교신저자가 제 친구이기도 한 아산병원 임영석 교수인 것을 보고 더욱 즐거웠습니다. 매우 기분 좋은 날입니다. 김형돈 선생님께서 언급하신 저의 아산병원 강의 자료는 아래 link를 참고하시기 바랍니다.